I'm more than a year behind on scrapping. OK I'll confess I've never even finished an album, so my goal for 2010 is to scrap 2009. Once a week I sit and make a layout for my scrapbook. You have to check out this website www.CricutSearch.com. This is going to make searching for images so much easier. Shawn also has a YouTube channel with great instructions on how to use the site. Have a great day and don't forget that October 2nd is World Card Making Day. Mark your calendars for a fun filled day of videos, projects, challenges and giveaways. Love the picture, love the LO, love the video! The technique for the curled up matting paper is cool! Great LO! Love all the flowers and butterflies! TFS! Thanks for the shout out to CricutSearch.com! I love your layout, and I just have to let you know, I am 2 years behind on my books . . . but now that we have the website complete, I can get back to work on those. Great picture of you guys. Love, Love, Love the layout. What fabulous paper. You did a lovely job. Even though I'm not into scrapbookking layouts, I can appreciate your creativity. Such a beautiful page. But, of course, everything you do is A+. And with all you do, it's a wonder you have time to do an album. Christina, Cricut Search is terrific. Even owning a G I can see me using it because the G images are small. How to get the word out to others though? Love that paper and your layout is just elegant! I LOVE the tattered edges on that paper! I love watching it speeded up. It looks soooo easy!! Wow, so creative! Thanks for sharing - I have a few years to do as well. And thanks for the cricut search info, you've just made my cricut life so much easier!! Woo Hoo!! Great great layout. I want to use the same idea for a layout in my sons wedding album. What a great layout and cute photo. Thanks! I SOOOOO LOVE this layout!!! Love those papers....the flowers, butterflies and bling are FABULOUS!!!! I also love the torn edges and the title at the right hand corner - WOOT!!!! 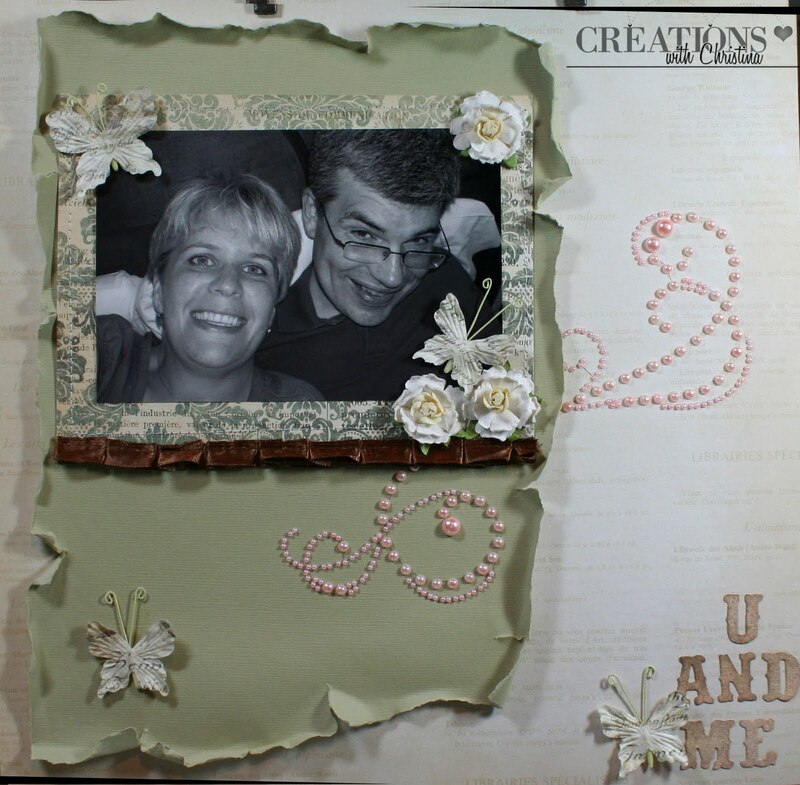 What a super easy yet intricate layout Christina so pretty! Christina, what an elegant layout! Everything in the layout coordinates beautifully. I really enjoy when you post videos and blog posts about scrapbooking layouts. I really enjoy them. =)Thank you for sharing. I love this layout. You did a great job. This is a beautiful layout. What a great picture of you and your hubby. I really like how you distressed the paper that the picture is on and the pearls look fabulous. Love it all! !